Nowadays many of us spend much of our waking moments sitting and staring at our smartphones – but here’s an app that will get us up and about and into the gym. 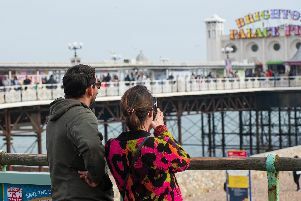 Go:Do is a new smartphone app being piloted in Brighton – which will match up fitness fiends with personal trainers. The app allows you to search for your ideal trainer – whether you want a bootcamp approach or something a little gentler. And to make things really easy, you can book and pay for sessions online. The idea is to take out the time-consuming process of to-ing and fro-ing to schedule in times with a personal trainer, giving you a calendar of their availability so you can book in instantly. As a fairly regular gym-goer, but not 100 per cent dedicated to the cause, I decided to give Go:Do a try to ramp up my fitness. I decided to go with Carmen Lucy of Fauna Fitness, who specialises in fat loss and helping people to get fitter and stronger. It was really easy to book in with Carmen, and you can communicate through the app to discuss where you will meet, or if you need to reschedule. Meeting with Carmen at a gym in Brighton, we talked about what kind of training I was already doing and what my fitness goals were, to tailor the one-hour workout to my needs. I decided I wanted to get stronger and focus on more weight-based training, as it’s sometimes a bit daunting using resistance machines and lifting weights when you’re in the gym alone. The training sessions with Carmen taught me a lot, from new exercises, how to use machines I’d never even noticed before, and to how to squat properly (I definitely wasn’t doing it right). It also gave me more of a sense of what I want to achieve when it comes to fitness, and made me realise I wasn’t using my gym sessions to my full potential. She did work me hard, and the next day I had aches in places I didn’t know I had muscles! It’s a great way to check in and see where you are with your fitness, and to make new goals to work towards. Whether you want a one-off session, or to train with an expert more frequently, Go:Do is a quick and easy way of accessing personal trainers in the city. It also means personal trainers can reach a wider audience, and the app takes care of admin such as scheduling and payments, so it’s win-win. Beth Cash, co-founder of Go:Do explains where the idea for the app came from. She said: “Go:Do is a fitness finder app. Our aim is to be the app for the active who want to achieve their goals. This includes both those looking to get fitter, as well as personal trainers who want to enhance their brand and reach more clients. Clients have everything in one place. Go:Do is available exclusively to Brighton for now, but the app will roll out in London and across the rest of the UK over the coming months. It’s also hoping to branch out by adding classes, yoga and Pilates teachers to the app. The Go:Do app is available to download in the Apple App Store on all iPhones here, and is set to be released on Android in the coming months.